The Perennial Plant Association, (PPA) a non-profit organization comprising growers, nursery owners, and other horticulture professionals, has named their 2004 Perennial Plant of the Year, and whereas I often ignore this kind of marketing-driven hoopla, this time around they’ve picked a beauty. Their choice was Athyrium niponicum ‘Pictum’ (Japanese Painted Fern), a truly exceptional garden perennial. As trees in our neighborhoods have matured and created shady areas where once there was full sun, the varieties of shade-loving ferns available to homeowners have positively skyrocketed. The Japanese Painted Fern is my favorite of all. You can’t grow a more striking fern. 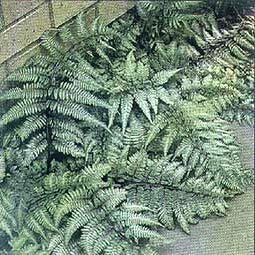 The twelve- to eighteen-inch tall fronds are colored a metallic, silver-gray with hints of red and blue. The soft, intricate shape and texture of the fronds provide wonderful contrast to their brazen color. Best of all – and this is one area in which the gurus of the PPA sometimes let us northern rubes down – the plant is hardy to Zone 3. These are truly living sculptures, and combine beautifully with hosta, astilbe, brunnera, sedges, lamium, tiarella, and all other denizens of the shade or woodland garden. Japanese Painted Fern flourishes in compost-rich, well-drained soil kept moderately moist. Division is rarely necessary. I can think of no shady spot where it should not be grown.